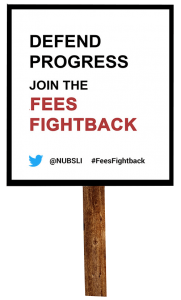 What is the #FeesFightback campaign? The campaign was launched by the National Union of British Sign Language Interpreters (NUBSLI), a branch of Unite the union, in October 2015. The campaign is a response to the downward trend in fees and terms & conditions, which is creating a profession that is unsustainable and unviable. The race to the bottom is gathering pace. Even formerly trusted agencies are beginning to try to impose 2 hour minimum fees. Together with the squeeze on our cancellation terms and travel expenses, this poses a serious threat to the future of our profession. If we act together in solidarity we have strength. Say NO to 2 hour minimum rates. Say NO to unreasonable cancellation terms. Say NO to cuts to travel expenses. Say NO to under-cutting your colleagues. You can add your signature below the letter or by using the ‘sign the letter’ link in the ‘what you can do section’ on this page and it will be added to the letter. For the sake of the Deaf community and the future of BSL/English interpreting in the UK, we the undersigned call on all interpreting/translation agencies to respect the fees and terms of BSL/English interpreters/translators. We understand that due to factors associated with government spending cuts and more companies entering the market some of you feel under pressure to source people to provide a quality interpreting service for less money than in the past. However, we urge you to consider the long-term consequences of not challenging the downward pressure on interpreter fees. Allowed to continue unchecked it will almost certainly result in a fall in the number of qualified interpreters. People to commit to the long and expensive journey required to become qualified? The work force to regularly give up time and funds to maintain a continued commitment to their CPD? Existing skilled interpreters to remain in a career that offers such low remuneration for an experienced professional? If we don’t all work together to halt this trend the service we are all so proud to deliver faces a bleak future. *an estimate based on an interpreter doing two assignments a day, five days a week at a fee of £60 per booking with little or no travel paid. British Sign Language/English interpreting is a profession that requires a lengthy commitment to undertake training for an average of 7-10 years at considerable expense in order to become ‘safe to practice’ and qualified. Interpreters also continue to devote ongoing time and funds to developing their skills through CPD (Continual Professional Development). For the interpreters who are employed, working either as staff or in-house interpreters, their salaries are usually in line with (or below) what a professional would earn in their geographical area. Employed interpreters also receive a package of paid-for benefits. However, freelance interpreters have a large number of extra expenses due to being self-employed, along with additional expenses specifically relevant to the profession. The cuts which are happening across society are part of the government’s austerity ideology, and yet many leading economists have said that this austerity drive is not an effective way to improve the country’s economy. Therefore no one should be putting up with this unfair treatment. Standards of living continue to drop and many families are falling into poverty. As a society we have a right to challenge these decisions and NUBSLI believe that we should be challenging them. As a profession we are not asking for a pay rise; in fact in real terms, due to inflation, our profession has already experienced a pay cut. We are simply asking that our income is not cut further by lower rates of pay and that we are paid fairly. To keep experienced, skilled interpreters and attract new trainees, the profession needs to be more secure with fair levels of remuneration to recognise the amount of training and commitment necessary. Insecurity of income is a very real threat to the future of interpreting and so it is essential for us to take a stand against fees that are not sustainable for interpreters or Deaf people. Interpreters are working together with the Deaf community to challenge and improve this situation for all of us. It could be easy to feel that the drop in income is manageable, because for a number of us within the profession it currently is. However, in certain parts of the country it has already become hugely challenging to maintain a decent standard of earnings, and the downward trend has been getting progressively worse over the last few years. If it is left to continue, and interpreters do not pull together to take a stand, it will not take long before you too could be struggling to pay your rent/mortgage/bills. The reality is that once you have factored in all the additional expenses of maintaining your professional status — CPD, insurance, registration, along with the costs of being self-employed — the remaining income is modest. We need to be a profession that continues to attract trainees with commitment and integrity who are prepared to spend large sums to become qualified, and continue to spend both time and money on enhancing their skills along their career. Let us stand together to keep our profession sustainable and secure in the long term and say no to unfair pay and terms. Our myth-busting page helps to further explain the reasons behind the campaign. Talk to colleagues and encourage them to support the campaign. Reply to every agency email that offers unsustainable fees and terms. Strengthen our work and show solidarity with the profession.